Secondly comes the Mantle! Although its solid you may also know it too hot for us to live on. Fresh volcanic material fills up the cracks that are made. Did you know it is also the largest layer in the Earth. The liquid rock of a volcano is the same you would find in the Mantle. 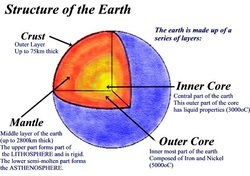 The upper flows more easily as the lower mantle because of temperature and pressure from Earth. The temperature of the Mantle, ranges from 500-900 ºcelsius. It is also 1,800 miles and about 2,900 km thick. The Mantle is about 80-84% of the Earth's total volume! The Mantle is separated into 2 different parts, the Upper Mantle and the lower Mantle! The Upper Mantle is stiff because of lower temperature. The Lower Mantle is tough, liquid rock.